Marijan Cekolj was born on February 21, 1955 in Samobor. He became literary active in 1975, and in 1978 he was one of the founders of the Samobor literary group Katarza (Catharsis). He published eight bulletins and two collections of poems and haiku poetry within the group. He published five books of poetry and eight books of haiku poetry. 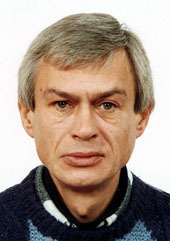 He is the author of the first Croatian haiku anthology HAIKU IZ RATA/WAR HAIKU (Croatian Haiku Association, Samobor, 1992) and the second enlarged edition issued 1995. Also, he published Croatian Haiku Anthology OTVOREN PUT/FREE ROAD ( SAMOBOR, 1999). In the field of culture and arts Marijan Cekolj is present for over 30 years. He is the founder and the president of THE CROATIAN HAIKU ASSOCIATION and the editor in chief of the International bilingual Haiku Magazine VRABAC/SPARROW as well as the publisher of the bilingual series THE CROATIAN HAIKU POETS, where thirty books have been published so far. His haiku poetry was published in many countries throughout the world in English, French, German, Japanese, Polish, Hungarian, Romanian and Slovenian. He is represented in all domestic, European and world anthologies of haiku poetry, Internet included. For his longtime cultural activities and his creative achievements he has received numerous commendations, awards and acknowledgements in Croatia and abroad. Prosao je voz / "The 1993 James W. Hackett Award"
Copyright © 2001 World Haiku Association. All poetry the copyright of the author. All translations the copyright of the translator.